Mother's Day will be here before we know it! 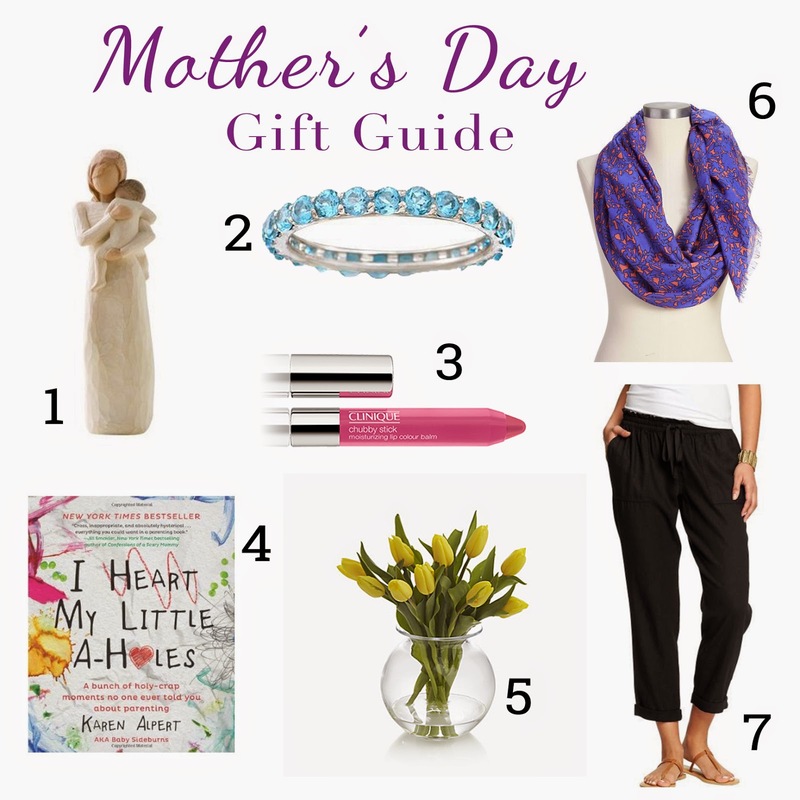 When it comes to buying gifts for the mother in your life (whether your own or your child's mom) I think there are a few categories that will always go over well. Being sentimental is always a good option. I love Willow Tree figurines. You can get one of a pregnant woman, holding a baby, holding a child, or even a grandmother holding a baby. In my opinion you really can't go wrong with one of these! Jewelry... women always love jewelry. And a birthstone ring would be sentimental too! I love the idea of stacking these dainty rings and representing the birthstones of each of your children. When looking up the November birthstone, I found some conflicting information. Technically Topaz is the birthstone for November. While most people think of the yellow topaz, some say that it's open to just topaz in general. Since I wear more blues and greens and Noah is a boy, I would choose the Blue Topaz. Something to make us feel pretty. Whether that's a simple lip gloss or a nice perfume, the options are endless. And if you are nervous about getting the right color or scent, how about a gift card to Sephora. I think all moms need some humor in their life, especially ones with young kids. I've heard great things about this book and I definitely want to get it in the kindle edition soon. Flowers... Instead of just getting a bouquet of flowers for mom, how about buying a pretty vase to put them in as well. I love how this vase is large on the bottom but has a thin top so that you don't have to put a crazy amount of flowers in it. I've recently been really into tulips and they look fantastic in the picture! Finally, women in general like clothes. If you know their size, these pants would be a great gift. They are comfortable but better than just wearing yoga pants all the time (which I'm guilty of often). If you are hesitant to get something sized, how about a pretty scarf... I also LOVE this scarf! What are your plans for Mother's Day? Do you still get gifts for your moms now that you are grown up? And if you are a mom, what would you love to get from your kids? Umm, I love all of this. Should I just link this page to Seth? LOL. I actually have that A-holes book but am super guilty and haven't even started reading it yet. Oops! I so want to but just need to find the time. Reading is my downfall. That ring is amazing though and I've been looking for one for forever and I of course love the scarf and the pants! Great stuff! I love that scarf! So bright and fun. And flowers and jewelry would be nice too! The chubby sticks are great! I love them :) And you can NEVER go wrong with flowers! I get my mom and my MIL hanging baskets every year for their outdoor spaces.